If you are a regular reader of my blog, then you know how much I like sandwiches. They are the most convenient thing to make for lunchtime meals, so we tend to have them quite often. To keep things interesting, I try to come up with new variations of chicken and tuna salads. This morning, I was trying to think up a new recipe for chicken salad. I went searching through my pantry for inspiration, and spotted a jar of Huy Fong Chili Garlic Sauce. If you haven’t tried this stuff yet, then you are missing out. It’s spicy and wonderfully garlicky! Two of my favorite things. Huy Fong Foods is the maker of the world famous Sriracha chili sauce, also known as “Rooster Sauce”. I had some fresh baby spinach in the fridge, which I thought would be a great addition to this sandwich. I was right. It paired perfectly with the other flavors of the chicken salad. I used some leftover hamburger buns that I had on hand, but you can use whatever bread you prefer. This chicken salad would probably also be great served in lettuce cups. In a small bowl, mix together the mayo, yogurt, lime juice, chili garlic sauce, cumin, and salt. Set aside while you prepare the rest of the ingredients. Place chicken into a medium bowl and flake gently with a fork. Add the onions, celery and carrot to the bowl. Pour in the dressing and mix until well combined. Refrigerate for at least one hour before serving. 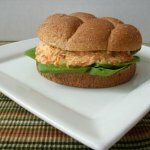 Place a handful of baby spinach onto bottom bun and top with one-fourth of the chicken salad. Finish with top bun. 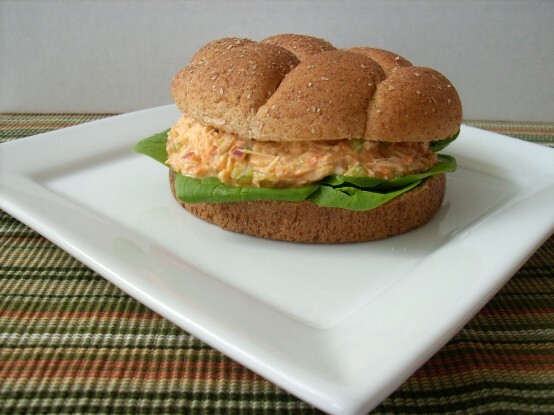 If you prefer a drier chicken salad, you can reduce the amount of mayo or yogurt. You can adjust the amount of Chili Garlic Sauce to suit your own desired heat level. You can always start with one tablespoon and more from there. By Tempie at May 26, 2017 . Previous Post: « My First 15K Race! I’m not kidding you, I do feel hungry every time I come here. 🙂 This sounds so good! I also love sandwiches, my husband always make them and they’re incredibly good! By the way, I loved reading your comment. Thank you for stopping by!